You might be wondering why there hasn't been a blog post in a while. I've been focusing my efforts of the production of a "Brewing Engineering." A book to capture the last year of research that I have conducted. Over 200 pages and nearly 50 tables designed to simplify the brewing process. Brewing Engineering is the culmination of extensive work done to understand how each part of the brewing process works. Understanding is developed into application and presented in a way that brewers can utilize, regardless of background. 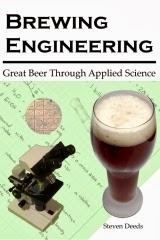 If you are a beer geek like me, I’m sure you’ll find reading about brewing science quite entertaining. If you are more of an artist, don’t worry: each exploration wraps up into practical application of the concept. If you have visited my blog, much of this information will look familiar. The most valuable posts have been included in this book. Each one carefully edited, and in some cases expanded on and even re-written. In addition, some of the information in this book you will not be able to find on my blog, or anywhere else for that matter! "There are issues with misspellings which can be numerous that, at best, distract the reader and, at worst, confuse them." "Some of these graphs or charts come with example test cases which also have confusing errors or are overly complicated. A solution for future works might be to include a URL for an interactive graph/chart that can be used to solve test cases or be used for personal brewing calculations." I was wondering if you provide any errata online for any mistakes you've caught? I'd love to buy your book but I'm concerned for the few errors that might affect me. A second edition of the book is in the works and will address the concerns that have been raised. If you have found this blog useful then the book should be of value to you. Brewing Engineering is written for the brewer with a solid foundation of the basics of brewing. If you are new to brewing some of the sections may seem rather complicated. in your book on page 48 you list the grain absorption rate at .15 g/# of grain but on page 51 you use .20 g/# in the example. Then on page 53 table 12 you go back to .15 it seems. I know that different grains and different moisture content of grains plays a part in this. Was there a reason for the variation? I found it hard to get the example to work out with the chart until I figured out what was going on.